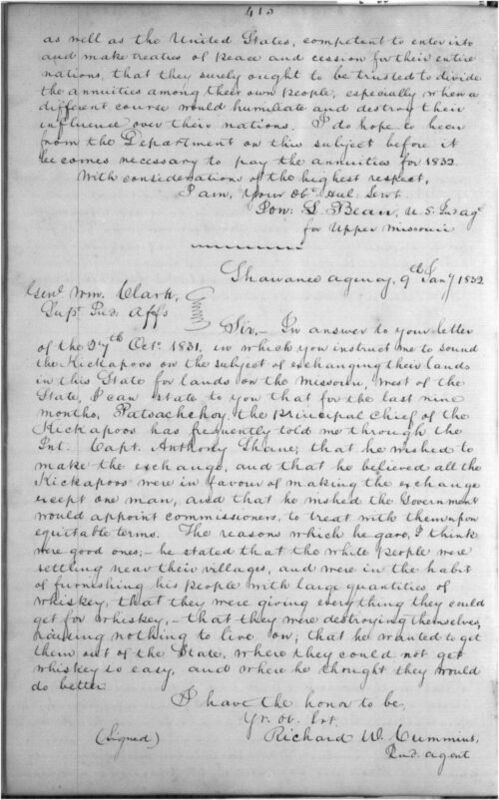 Richard Cummins, an agent to the Shawnee Indians, wrote this letter to the Superintendent of Indian Affairs, William Clark. Cummins informed Clark that the Kickapoo Indians, under the leadership of Chief Patsachehoy, were prepared to move from Missouri to Indian Territory (present-day Kansas). The Kickapoo had given several reasons for why they supported removal, including the fact that white settlers were encroaching on Kickapoo Territory and selling the Indians large quantities of whiskey. This short letter provides an example of how some Indian tribes supported removal as a way to protect themselves from white abuse and encroachment upon Indian lands. It could be grouped with various other sources explaining the reasons for removal (including both native and white perspectives).